Bali is a'Dream land from Indonesia..
Nestled against the shores of Bali's famed Kuta beach on an impressive three-hectare prime site right in the heart of Bali's entertainment and shopping district, Hard Rock Hotel Bali (Google Map) is Asia's first Hard Rock Hotel. For your accommodation in Bali, this Bali resort features 418 tribute rooms and suites fit for a rock star. The walls are adorned with images, memorabilia and icons reflecting the revolution that changed the face of music, fashion and arts, celebrating artistes from the 50's to late 90's. Rockin' Tots to Grunge Grand Dads, the hotel is here to rock yer socks off! With Hard Rock's signature of limitless energy, unparalleled creativity and quality service, Hard Rock Hotel Bali is a place where hotel guests can rekindle the atmosphere of the past 40 years of rock and roll culture! Music maniac can try out their vocal skills at the Boom Box Recording Studio in Hard Rock Hotel Bali. For fitness and recreation enthusiasts, it is a high FIVE. Splash your body with cool waters at the free-form swimming pool or enjoy wonderful body therapy treatments at the hotel's Rock Spa, or opt for 5-meter of rock climbing within the premises. Follow a healthy routine by exercising at the in-house gym centre which is equipped with equipments, sauna and steam rooms. With a wide selection of dining choices available in this beatutiful Bali resort, travellers can choose from the many cuisine each featuring a distinctive style. For meetings in Bali, business travellers can discuss corporate strategies or organize themed events, private functions or dinners, at the meeting and conference rooms of the Hard Rock Hotel in Bali. The ballroom can hold up to 400 guests. Come to Hard Rock Hotel Bali and feel like a star! It is all about the experience. One of the biggest expenses associated with a wedding in Bali is the cost of alcohol (if you are hosting a group of guests anyway). The taxes on alcohol are extremely high in Indonesia which is the reason it has been difficult to obtain good wines locally in the past. Hotels and Restaurants ofcourse markup the prices of alcohol considerably but most will allow you to bring your own wines and champagne if you prefer. Keep in mind however most times you will be charged a corkage fee for doing so. This fee can range from US$5.00 per bottle to US$25.00 per bottle depending on the property you are utilizing. If you are in a private villa ofcourse you are free to bring as much of your own alcohol to your function as you choose and no corkage fees will apply. There are now two companies in Bali providing Australian Wines of reasonable quality. On is known as 'Wine of The Gods'. This company brings the grapes from Western Australia but treats them and bottles them locally. They currently offer one two types of wine - both white. One is a very sweet wine and the other a more standard dinner wine. Prices currently start at Rp100.000 per bottle. The other company, Bounty Wines offers reds and whites of various type. They import wines both from Australian and from Chile. These wines have proven to be of a reasonable quality and quite popular. Prices currently start at Rp100,00 per bottle. Given sufficient time, both the above wine importers can create your own private labels showing the name of bride & groom, date and place of the ceremony which is rather nice to have on the table or, perhaps to give your guests for a gift. Catering services cannot be used within a hotel but if you are in a private location or a villa you will no doubt need to find one to suit. There are a variety of catering companies available in Bali these days and some of them are excellent. Most will organize the decorations for you as well which is helpful since it involves less hands in the preparation of your event. You will be able to obtain flexible sample menus and price lists from your wedding organizer if you have chosen to use one and, they will recommend the caterer most experienced at the particular style of event and type of food you require. Indonesian Government remains concerned about people being dressed politely and appropriately when dealing with them. Since all legal weddings will have a representataive from the Government Registry office in attendance it is important to comply with their request for appropriate dress. Men may not wear sleeveless shirts and ladies may not wear see- through or midriff (ie: exposed stomachs) outfits. This dress code applies not only to the Government Registry officials but to any Government office with which you might be dealing eg: immigration, police etc. and is something you should keep in mind when traveling to Indonesia if you wish to be treated with respect and good manner. The following countries have a consulate in Bali . The following countries have Embassies or Consuls in Jakarta. There are certain types of flowers readily available in Bali although some are seasonal and may not always be there when you want them. The more common tropical flowers such as frangipani, orchids, lillies and tuber roses are generally available year round but other types of locally grown flowers are not always available. Because of the type of flower more commonly available colour selections are somewhat limited and if you choose something different you may need to pay the price for having them imported from Java or indeed from overseas. If this is the case do allow lots of time when ordering or you may be disappointed. An experienced wedding organizer will be able to give you all the information you need about just what is and is not possible. Gift Registries such as those so easily available in the western world do not yet exist in Bali though there are some fabulous shops offering some excellent items suitable for wedding gifts and not too big to carry home. A beautiful selection of antiques, ornamnets and decorative objects from Asia. Offers homewares such as vases, candle stickes and zen slippers. Offers homewares and lifestyle products that combine the exoticism of the east and functionality of the west. Candles, tableware, frames, furniture . A professional wedding organizer will usually have some excellent suggestions for gifts for your guests and likewise for gifts wedding guests may like to organize for you. You will be able to either see their gift ideas on the net or have them email them directly to you. 1-Communications - you want to be certain the hairdresser can understand exactly what you are saying so the result will be what you have asked for and not just something they are used to doing for Indonesian functions which require an enormous amount of teasing followed by an enormous amount of smoothing out and applying hairspray. A photo will probably help but do make sure they have the equipment they need before beginning eg: if you wish to have your straight hair curled ensure they have curling tongs etc. 2-Time - if you do choose ultimately to have your hair done by a local hairdresser, after explaining the hair style and being sure they have understood, ask how long they believe it will take. Whatever their answer - triple it to be safe because our research has shown the local hairdressers to be very slow workers. You simply must not allow yourself to become stressed on your wedding day and because you do not wish to arrive late for your ceremony you must be finished preparing a minimum of 30 minutes before your scheduled start time. Being stuck in a hairdressers chair unfinished close to start time, knowing you still have to get back to the hotel and shower etc. will create dreadful stress that you simply do not want or need on this very important day. Perhaps, if you are in Bali far enough in advance you could have a trial run at the local hairdressers' you've chosen to use. When requesting a hairdresser and makeup artist through a wedding organizer do make sure you ask them whether the hairdresser service they provide is conducted by a local or westerner and remember to set an early time for hairdressing and makeup if your organizer uses a local hairdresser. There are one or two western hairdressers living legally in Bali and operating as hairdressers and also at least one Indonesian lady with vast experience working overseas in Cananda. The prices for these excellent operators are all about the same and you may like to ask your wedding organizer if they work with any of them. Sos Clinic - Kuta, used by some major travel insurance companies. Prima Medika Hospital - Denpasar, brand new, spotlessly clean with all modern equipment. Everyone traveling overseas should certainly have travel insurance to cover any cancellation fees or other types of loss which may be incurred under certain circumstances. We advise that you check with your travel insurance agent whether the cost of your wedding is covered in case you are forced to cancel for reason. Rindik Musicians - Balinese bamboo xylophone instrument, generally two men seated crossed leg playing. Sometimes they play with a 3rd man accompanying them on bamboo flute. This music really creates that 'atmosphere' of Bali and is ideal for pre and immediate post wedding ceremony rather than for entertainment as such. The prices you will be charged for Rindik Musicians depend very much on where you are having your ceremony ie: prices range from US$20.00 in a mid-range property to as as high as US$200.00 in some of the more expensive properties but the average seems to be around US$75.00. Gamelan Orchestra - generally comes along with Balinese Dancing Group who will perform any number of dances. The dancing usually lasts 45mins to 1hour and consists of 2 or 3 dance types. The Gamelan orchestra is very typical of Bali and made up of many amazing instruments including very large brass xylophone type instruments, gongs, cymbals, drums and more. The prices you will be charged for Gamelan Orchestra with Dancers will range anywhere from US$ 70.00 to almost US$400.00 but we have noted the average for this type of musical entertainment tends to be in the range of US$250.00. You need to realize that photographers in Bali are not the same as in the western world. They don't use studio umbrellas, step ladders, fuzzy lense covers or other fancy equipment. Our research has confirmed that local photographers use good quality cameras, lenses and flashes to capture a special event and, that the most experienced have an excellent eye for a good shot and can work well with couples to create a very special selection of photographs of their day. The most experienced wedding photographers work with the most experienced wedding organizers and you should have no trouble in obtaining a number of samples of their work so, ask to see a selection of photographs - not just from one or two weddings but from a large range so that you can be sure of their experience. Much the same conditions apply to the work of videographers however it is not easily possible to obtain samples of their work. Rest assured that a professional wedding organizer will be offering a professional videography service. Do look at the comments from past wedding clients on a wedding organisers' website - here you will often find feedback from couples about the photography and/or videography services they received. The marriage law of Indonesia requires that for a Pre-Nuptial Agreement to be legal it is presented to the appropriate Registry Office before the day of the marriage. If you have decided to make a Pre-Nuptial Agreement then we suggest you have it prepared by your lawyer or other appropriate legal body (such as Notary). You should keep one original each and put a 3rd original in a sealed brown envelope for delivery to the Indonesian Government Registry Officials prior to your wedding. Before delivery you will need to have the document legalized by an Indonesian Notary. A professional wedding organizer can advise on this and have the processed organized on your behalf. We know that without a doubt you are wanting a dream wedding in Bali! The form that dream takes for you is yours completely and you should be able to have it come true. There is little that cannot be arranged in Bali. The people of this island are naturally talented in music, performance and the arts. Decorations can range from spectular to simply elegant etc. and there's a multitude of different resources which can be called upon to give you just what you want. You may be on a budget but even so remember professional wedding organisers will usually be understanding to a certain degree and if approached politely may agree to at least a little discount to help. Don't be unreasonable and expect them to organize the wedding of your dreams for nothing or next to nothing. Professional wedding organizers - those with offices and licenses anyway do have real expenses in order to operate, rents, taxes, website and other promotional efforts, experienced wedding consulting staff, communications, transport etc. Be grateful for any discount you might receive or any extras you may be able to negotiate. Clearly you have many, many options but our serious advice is to go through a professional company with strong credibility and relax whilst knowing you are in good hands and will thoroughly enjoy your wedding on the Island of The Gods. It is a wonderful idea to get a massage a day or two before your wedding. Not only will a massage help reduce your stress level, but can release painful muscle tension, improve circulation, increase joint flexibility, and reduce fatigue. In simple terms, a massage will make you feel great. May we recommend a visit to one of the Spa's below to toally relax you and your partner before the big day! Many hotels also have inhouse spa services. All sorts of transport can be organized in Bali; from horse & cart in certain areas for short trips, to the more often preferred chartered buses, minivans, sedans and limos. For those with the more adventurous spirit ask your organizer about Harley Davidson bikes and helicopters. If you have chosen to use a professional wedding organizer you will find they are able to give you much information and perhaps even samples of your wedding liturgy and vows in advance. 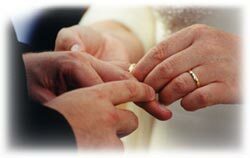 You are in most cases able to write your own vows and your own ring statements and add readings etc. to your certain parts of your ceremony. Flexibility often depends on the type of religious ceremony you will be having and there are some which will not offer any opportunity for change at all. March to September is the dry season in Indonesia and so rainfall is generally quite rare during these months. Average day time temperatures of 32c, low humidity and cool evening and morning breezes. The on shore winds are strongest on the east coast (Sanur) side of the island during dry season. It is fairly safe to organize an outside wedding venue during the dry season. October to February are wet season months. You can expect rain much more often during these months and certainly a higher level of humidity. Average day time temperatures of 36c prevail and the stronger onshore winds affect the west side (Kuta/Legian etc) of the island. Wedding ceremonies tend to be booked for 4-5pm in Bali. Many couples would like to be married at sunset but it's not always possible and the earlier times prove more suitable because a) the sun sets very quickly in Bali and is gone before you know it - you certainly don't want to be marrying in a lovely garden area but in darkness and, b) if starting earlier you will not miss the sunset but can enjoy it in a more relaxed way for photographs after your ceremony has ended. Some hotels are able to offer covered but still open venues to be used in the case of rain. This is obviously a good thing because you can still enjoy garden views and the fact that you are marrying in Bali remains obvious. Not all properties however, have a suitable wet-weather alternative and will instead allocate a closed-in ballroom or function room for your event. This obviously is not ideal since you don't get to enjoy those tropical gardens for which Bail is so well known and which may well be one of the reasons you have traveled there in the first place. Ofcourse you might still be able to go outside and have photographs in the garden after the ceremony should the rain cease in time. If you are planning to marry between October and February do remember to ask the questions about the alternatives they are able to offer in case of rain. Well known for its fabulous shopping, restaurants, bars & nightspots as well as its surfing beach and magical sunsets. To the young at least Kuta has earned itself the reputation of being the very 'heart' of Bali, offering everything from the smallest of shopping stalls to the very latest in boutique fashions, famous surf gear shops and multi-storied departments stores. Just about anything can be bought in Kuta and the buying is fun. The choice of accommodation in the Kuta area is enormous, ranging from the smallest of budget 'losmens' through moderate bungalows and hotels such as Legian Beach Hotel, Bali Mandira and the Bali Intan up to the rather luxurious beachfront properties like the well known Hard Rock Hotel, it's new next door neighbour the Mercure and the lovely Kul-Kul. Many couples like to have a wedding on the beach, but it is recommended instead that they select a hotel which offers a garden area directly overlooking the beach or one which offers ocean views. Unfortunately in the Kuta area now almost every hotel has a road across the front between the property and the beach and therefore have lost that direct 'step onto the beach access' that once existed. Once known as Southern Kuta, the Tuban area is not a very long walk (especially via the beach) from Kuta itself, however is a world away from the hustle and bustle of the more central Kuta. A more relaxed atmosphere prevails in Tuban and yet there is still a great selection of things to do such as the Waterbom Park, Go-Karting & Sling Shot and a good selection of restaurants offering various fares from around the world. There is even a new Bottle Shop selling fine brand wines and other alcoholic beverages right below the well known surfy restaurant ALL STARS in Tuban. Many of the hotels in the Tuban area are located directly on the beach and are therefore popular with couples because a marriage can be performed in the hotel gardens and then the couple may step onto the beach for some more relaxed photographs and fun with the locals. The Discovery Kartika Plaza Beach Hotel and The Bintang Bali have proven most popular with wedding couples over the past few years and that's because they are so well located. Of the two however, Discovery Kartika Plaza offers the very best in terms of gardens and space. A little further back towards Kuta is the Bali Garden Hotel which has just come back under its original management team and whilst this property offers simple accommodation it is very clean, very central and has one of the very best beach fronts available in the Tuban area. A little in the opposite direction is the well known and popular Holiday Inn Bali Hai which is popular with families so always has lots of children around. For weddings, it has a lovely private garden area directly overlooking the beach and hidden away behind their 'villa accommodations'. Very few even know this area of the hotel exists and yet it offers the chance for a fairly private ceremony and a cocktail party or dinner in this spot is a delight. A booking in the Villa is necessary to ensure the garden area is available to you for your wedding ceremony and function. Located on the southern peninsular of the island, Nusa Dua and Tanjung Benoa seem to be a world away from the hustle & bustle of activity in other areas of the island but it's actually only a 20 minute drive from the airport, and the shops and nightlife of Kuta. Known as Bali's premier resort area, Nusa Dua offers an enormous selection of 5 star resort hotels such as The Nusa Dua Beach Hotel, Sheraton's Laguna and Nusa Indah, The Grand Hyatt, Amanusa Resort, Club Med & Hilton to name but a few. All of these properties are beach front, except Amanusa which has ocean views and a private beach club, and offer fabulous gardens so are excellent locations for weddings for couples with a 5 star budget. Lots of shopping opportunities are available too in Nusa Dua! The Galleria Shopping Centre offers a collection of fashionable boutiques, specialty shops and restaurants. In the even quieter area of Tanjung Benoa just a couple of kilometres further on than Nusa Dua another selection of hotels such as the Club Mirage & The Grand Mirage, the excellent value Novotel, Melia Benoa and the small but lovely Suites Hotel Bali Royal are available beachside. Although beach weddings are not generally recommended, there are a couple of quiet public beach spots you can use for a small and simple ceremony in the Nusa Dua area - an experienced professional wedding organizer will know these. A far less frantic pace is to be had here in Legian and Seminyak! You can enjoy a more peaceful environment a good selection of boutique hotels and still be close to shops and nightlife. There is an enormous range of restaurants located in these areas, so if you don't feel like heading back south to Kuta for shopping and entertainment, there really is no need. Some of the most lovely beachfront hotels in this area are The Bali Oberoi, The Legian and now the new Santika Villas right next door in the 5 star category and the Resor Seminyak and Intan Bali in 3 star category. Not on the beach, but a delightful property in which to marry, is the Villa Lumbung. There are a number of spectacular restaurants on the beach fronts of Legian and Seminyak and a few of these are just perfect for a wedding ceremony. The now famous Ku-De-Ta Restaurant and the newly refurbished and styled Gado-Gado Restaurant to name only two. Many people already know the La Luciola Restaurant where you can relax and enjoy breakfast, lunch or dinner, but unfortunately this restaurant does not host weddings on the property and more often than not will not accept a group reservation. Both Ku-De-Ta and Gado-Gado Restaurants are most welcoming! Tanah Lot is only about 30 minutes drive to the west of Seminyak and the Le Meridien Hotel offers spectacular gardens, an incredible golf course and views of the Tanah Lot Temple from their lobby, bar, main caf?/restaurant and western gardens. Unfortunately these days the view of Tanah Lot is marred somewhat by a new bridge style construction running from the mainland to the Temple and beyond to the sea but a clever photographer will be able to pose you in such a position that you really do only get the Temple as a backdrop at least once after your ceremony. Relatively unknown a decade ago, Candi Dasa is now a popular and relaxing retreat that has managed to retain its village identity. Attractions include snorkeling, scuba diving and tours to the seaward temple of Candi Dasa and the ancient traditional village of Tenganan famous for its mastery of double ikat weaving. You can expect to find plenty of accommodation, restaurants, bars, souvenir shops, and some nightlife. There are fantastic views from the headland and, on a clear day, Agung Mountain rises majestically behind the range of coastal hills. The panorama encompassing islets to the left, Nusa Penida directly ahead and the headland to the right is easy to admire, with most of the hotels and resorts facing directly out to the sea. There a couple of lovely properties in this area to hold a wedding eg: the deluxe/5Star Le Meridian Nirwana Resort which has views to the famous Tanah Lot Temple from the garden area where wedding ceremonies are held in the dry season and, a much smaller more rustic property known as the Waka Tangga is another lovely choice. This property has only a handful of bungalow rooms, one restaurant and pool, all overlooking the ocean. One of the really special things about this small property (apart from the fact it is intimate and friendly) is the fact that it is surrounded by rice paddies and also offers views of the mountains in the distance. The north coast of Bali offers a different environment and atmosphere again from the other areas. A wedding here is possible but you will need to plan a minimum of one night stay. Lovina is for those who like still waters (no waves) and are not fussy about the color of the beach. You may even encounter some local dolphins during your stay here. Tourists looking for a quiet beach resort head for Lovina. A long stretch of safe beach and a perfect place for swimming and snorkeling. Lovina also offers early morning dolphin viewing and is the perfect base from which to explore northern Bali. You'll find that to have a wedding here in the North of Bali usually requires additional fees because of the time and distance involved in attendance. Couples wanting to have that 'real Bali' feeling tend to choose Ubud as a location for their wedding ceremony. The artist colony of Ubud offers a great atmosphere, lush tropical gardens and, in many of the possible venues, wonderful views of the surrounding hills, valleys and rivers. Although it is somewhat centrally located on the island and does not have a sunset as such, the Ubud skies generally display wonderful colours at sunset time which you are certain to enjoy. It takes only about 40-60 minutes to reach from the main areas of Sanur and Kuta/Legian and there are some excellent restaurants available where your ceremony and celebration may be enjoyed. A professional organizer will be able to mention at least 3 or 4 great choices. It is possible to have wedding ceremonies on both of these islands however surcharges naturally apply to cover the extra time, transportation and meals required to be costed into such arrangements. The other point about weddings on these islands is that it is often not possible for the legal part of your ceremony to take place at the same time and place as your religious ceremony. Your organizer will be able to give you the details and solutions on this issue, which may result in your having a different date on your religious certificate to your Government legalizing certificate. At 3.30pm all the day trippers depart from Nusa Lembongan and the island becomes a perfect peaceful place for your wedding ceremony however, you will need to cover the costs of your Minister, Registrar and Wedding Organiser to either hire a charter boat for their return on the same day or, to stay overnight if you wish to have the wedding later than 4pm on this nearby island. It is absolutely not possible for any couple who are not genuinely of the Balinese Hindu Faith to be married either in the Balinese Hindu way or, to be married in a Balinese Temple. The best you can do is select a location which has a Balinese Temple in it. This temple can then form the backdrop for your ceremony and is a fine alternative. All hotels in Bali have a temple on the grounds and, although some temples are very small and others very large, a number of properties have sufficient area near their temple to allow this to be a possibility for you. Bali does not offer much in the way of public areas where couples may celebrate their marriage. Even the rice paddies are owned by local families and you are not therefore able to just pick a rice paddy and have your wedding on it. This would effectively be trespassing and most impolite. In any case rice paddies are not ideal wedding spots because you cannot be sure that they will be green at the time of your wedding or whether they will be undergoing their regular harvesting and/or burn off process. Snakes too, are often found in the paddies and therefore represent a real concern. Not only this but the land between paddies is extremely narrow and the possibility of slipping into a wet paddy is not an attractive one at any time - even less so for a beautiful bride. Because of the lack of public space available, most couples choose to be married either in the gardens of their hotel or private villa accommodation. Because the gardens in Bali are so lush and tropical, this tends to be the very best solution. Most hotels and villas will charge a fee to any couple choosing to be married on the grounds even if the couple are staying there. In the case of a hotel, this fee will generally provide some decoration whereas with a private villa the fee is basically to cover wear and tear as well as extra work required by villa staff to assist with your event and won't actually include decorations. These need to be organized separately and can be done by your organizer if you choose to take our advice and use one. Some, but not all hotels, permit non-staying guests to be married in their gardens but of course will impose certain rules and regulations in this case, for example, they will charge a fee for using the space and the fee for outside guests is most times higher than the fee imposed on inhouse guests. Generally the fee will include some Balinese style decoration. Whatever your location, it is important that you are aware from the start just what fees will be imposed by the particular venue you select for the specific arrangements you require as well as any additional regulations they may impose. For example, some hotels and almost all villas insist on the couple staying a minimum number of nights, others insist you book a meal there for your wedding party and yet others will insist on both of these and maybe even more. Should you decide to book a private villa for your accommodation in Bali and have your wedding ceremony there, additional fees will be imposed for any decorations, musicians and other items you may request as well as a 'function fee' and a 'security bond'. A wedding organizer is best to organize items related to the decoration and layout of your villa wedding and will quote you the price based specifically on your own requirements. Not all villas will permit large group functions on the grounds so, if you wish to select a private villa for your accommodation, do make sure you ask the question of whether you are able to hold your function there and request a detailed explanation of any particular restrictions which may be imposed upon you. For example, if you plan to have a band or DJ for your group to dance to you will no doubt find there will be restrictions about the time the music must end. This is in consideration of nearby neighbours and is an important issue of 'good manners and respect'. Of course, hotels also generally have a time restriction on various forms of entertainment in consideration of their other guests. -Is there enough electrical power to support a band or DJ and extra external lighting you may be planning to utilize? If not, can the villa management arrange for additional power for your function and at what cost to you? -If you are planning to utilize Balinese musicians and/or dancers, it is preferable to have the villa management arrange personnel from the nearby vicinity rather than bringing performers from other villages. Again this is a matter of courtesy and good manners. You will find that the local people are far more positive about your function if they are actually involved in it and you will, at the same time, be helping them earn additional income for their village. Of course if you are not planning to utilize musicians or performers of a type available in the village, it is not an issue. There are a number of hotels on the island which actually provide 'villa style' accommodation and these are a great alternative if you are having a small, intimate wedding and want it held within the privacy of your own villa surrounded by all the facilities a hotel offers. You need to be aware, however, that a number of hotels with villa style accommodation will still insist upon your purchasing their decoration package and will not agree to your having a ceremony without it. Again, ensure you clarify the rules and regulations with which you will be faced in advance of making your decision to avoid any unexpected or unbudgeted costs arising afterwards. When requesting information on a villa as the potential venue for your wedding function be aware that there are different categories of villa ie: styles (not just quality). Stand Alone Villas - Complete privacy and complete facilities and appropriate number of house staff. Villa Complexes - One property with a number of villas on it - some need to share a pool, whilst others have a pool for each villa. House staff may be full time but are often available on call instead. Villa Hotels - Operating more like a hotel but with villa (bungalow style) accommodation often only providing hotel type room services such as daily cleaning. Whereas Villa hotels often have the bare minimum in kitchen facilities such as small refrigerator, electric jug and gas burner. Private Villas for rent with beach frontage are extremely limited in Bali and those that do exist charge a premium price for their accommodation and often have a high number of minimum nights before agreeing to permit a function onsite. Many couples planning to marry in Bali have dreams of being married barefoot on a quiet beach however, in reality, this is rarely possible not generally recommended. The reality is, that Bali has no private beaches. All beaches are public, even those right in front of a hotel or private property, and they are therefore open to all who wish to walk or hawk them. A wedding ceremony on a beach is not recommended because the local people who are by nature a funloving and happy race will come up close, chatter amongst themselves, giggle and enjoy the event without realizing that they are creating disruption and distracting you from the solemnity of your ceremony. For this reason, you should consider having your ceremony within the confines of a hotel or villa garden overlooking a beach. This way you will generally have the peace and quiet you require whilst declaring your vows to each other, but can go down on to the beach for photographs and fun afterwards. There are a limited number of hotels in Bali with small, secluded sections of beach which although they are not in fact private are, because of the difficulty reaching them just about private. However, these beaches are few and far between and are all in the 5 star, deluxe price range. These days there are a multitude of wedding organizers on the island of Bali - all tout themselves as experts with lots and lots of experience but, in reality, the majority of them are newcomers to the world of organizing weddings and have limited experience. Many, in fact, have been opened only a few months! There is currently no government body or association concerned specifically with wedding organizers in Bali and for this reason unlicensed people can get away with operating freely. The down side of this from your point of view, is that there is absolutely no recourse if any such organization or individual disappoints you in any way. We recommend you exercise extreme caution in making your selection from those on the island claiming themselves as wedding organizers, since the vast majority see organizing your wedding as a way to make a quick dollar rather than as something special they should be totally dedicated to do. Few can offer suitable experience or the required expertise and knowledge to ensure your wedding ceremony goes off without a hitch. Such organizers may be able to present a wonderful website and some may even be found these days on the larger search engines but remember a website itself does not make an organization professional! Our research has shown that despite a fairly decent looking website the vast majority of wedding organisers in Bali don't have a license let alone an office, but operate privately from their residence. The fact that they do not have an office is generally disguised by such organizations in statements such as "we will come to your hotel after your arrival to save you the trouble of having to travel to our office" or, "we are the only company who will come to you for your pre-wedding meeting" and other similar statements. Since you probably have to travel to your Consular Representative anyway after arriving in Bali, we would suggest that it is not a problem for you to pop in to your organizers' offices on the same day. At least you will then know you are dealing with a professional organization. The wonderful worldwide web makes it possible for anybody to create a .com name and a website these days but, we at A WEDDING IN BALI .COM urge you to look beyond the site. Look for an address, ask for a license number (a copy if you wish), do they have a company bank account etc., or are they just individuals trying to make a quick dollar? We strongly recommend you give serious consideration to entrusting the most important day of your lives to an "unofficial" wedding organizer. Whether they have an office to which you may visit when in Bali. Whether they offer more than just email for contact. Whether they have a bank account in the name of their company. If it is in a personal name or in the name of some other totally unrelated business name then it is probably an account borrowed to receive your funds. Not having a bank account in the name of their company indicates that they do not have a license to operate because a business bank account cannot be opened in Indonesia without the proper company documentation being presented to the bank. We certainly recommend that you do not send your hard earned money to a personal bank account or any account which appears to be unassociated with the name of the wedding organizer you have selected. Remember that if something goes wrong when dealing with an "unofficial" operation you have absolutely no recourse in the case of your needing to request a refund for any reason and no way of ensuring your claim is settled. The issue related to bank accounts and payments is particularly important when you are being asked to send your hard earned money in advance. It is understandable that payments for wedding services are required in advance - this is an appropriate practice however, we are saying that you must take great care! If the company is a registered company, their legal name will be preceeded by a PT (Proprietry Limited). Again we would remind you that A WEDDING IN BALI .COM is not a company which organizes weddings and will never offer to do so. Likewise we are not opposed to people getting ahead in life by offering this service to you without all they should have to ensure perfection but, we do however, want you to be aware of as many different points as possible before making your decision. This way you can make a totally informed decision based on all the pros and cons. Having been involved in travel to and within Bali and other parts of Indonesia for some 3 decades however, we are very concerned that a wedding in Bali for every couple who may choose to have one will be a wonderful experience and result in nothing but happy memories for brides and grooms, as well as any family and friends who may join them to celebrate in Bali. A wedding ceremony is far too important to be allowed to go wrong in any way! Take our advice and entrust your wedding to a professional wedding organizer. So you have decided to marry in Bali!! Congratulations on a wonderful decision!! Provided everything is handled the right way, we are confident that your decision to marry in Bali will be a decision you'll have no cause to regret. Will your wedding be a formal, semi-formal or casual style of event? Where is the place most suited to your own special requirements for the type of ceremony and reception you seek? What reliable vendors are available in Bali for things such as still and/or video photography, hair & makeup, catering, music, flowers, etc.? Will you have a buffet or sitdown meal? Will you serve cocktails and canap?s? What is the best schedule to follow? What special gifts can you organize for your guests? You could spend months researching and still not get to the most experienced and most professional vendors available in Bali - most don't have websites after all and that makes it even harder. Don't put yourself through it! Engage a professional wedding organizer to do it all for you! You just give them specifics of what you want and they'll give you detailed information on every little item. A professional wedding organizer will assist the bride & groom from start to finish - in the selection of locations, photographers, florists, caterers, musicians, meals, entertainers, etc. They will make suggestions for decorating, choosing ceremony texts, ensure you meet all the required procedures for having a wedding in Bali and much more. A professionial wedding organizer is someone who will minimize stress. Unlike other countries, wedding organizers in Bali tend to charge a flat rate to make all arrangements for you and then charge for any additional items you may select over and above your ceremony. Some may think a wedding organizer is an unnecessary expense - this is not true! It is also the reason some couples will make their choice based on the lowest price rather than on professionalism, experience and solid reputation. It is only when something goes wrong those couples regret their decision to try to save money on this very important service. Wedding organizers can actually save you money because of the amount of repeat business they give to certain vendors and, they will most definitely provide you with services of quality in each area they organize. A professional wedding organiser will not utilize a vendor who is less than professional because their own reputation is at stake and a wedding organisers' best advertisement is a satisfied couple! It is possible, of course, to organize your wedding in Bali yourself but, if you plan to do so, be prepared for a frustrating time in getting your message across, obtaining accurate information and having things work out exactly the way you want them to. There are a number of reasons you should think very carefully about organizing your own wedding in Bali. First of all the language barrier - this is a definite concern because you may either end up with something you do not want and expect or alternatively, you may end up without something you particularly wanted and expected. Although Ministers and Registry Officials can speak English, most do so rather haltingly in matters apart from their own or regular text scripts and their written English is certainly not wonderful. This should be a real consideration because you will be orgnaising everything long distance. Secondly, there is the simple issue of different cultures and therefore different concepts. It is just a matter of a Balinese or Indonesian finding it difficult to comprehend the needs, thoughts and requirements of a western bride and groom. Indonesians, and particularly Balinese, are the most happy and helpful people in the world and will definitely do whatever they can to help you. However, where your wedding is concerned, a lot more than a friendly smile is required to make everything run smoothly and you will want much, much more than a smiling apology afterwards if things don't run to plan and you feel disappointed. Sure, you will save yourself the cost of a wedding organizer by doing it all yourself but, we must ask you - is it really worth it? The last thing you want is to travel all the way to Bali and experience a lot of stress and worry about your wedding. Isn't one of the reasons you chose to be married in Bali was to avoid the stress and worry generally associated with organizing a wedding ceremony back home? A wedding in Bali can be even more stressful than at home if arrangements are not made precisely in keeping with your own personal requirements and if you have any reason to be uncertain whether you will or will not receive exactly what you want! for the strong possibility of regretting your decision afterwards. Just ask yourself "Is saving some money worth the risk of having the most important day of your life spoiled?" And, "are we willing to take a chance?" Unlike other countries of the world, it is not possible in Indonesia to be married by a Civil Celebrant and, in fact, there is no such thing in Indonesia. The only way for non-Moslem couples to be legally married (as mentioned above) is to have a religious ceremony followed by the Government Registration of the marriage. Overseas Celebrants are only licensed and legally permitted to perform a wedding ceremony and provide a Certificate of Marriage to a couple when the marriage they perform takes place in the country where they are licensed to practise as a Marriage Celebrant. They are not legally permitted to provide such a service in Bali or anywhere else in the world. We understand that Australia is currently (and in fact has been for quite a long time now) giving consideration to allowing licensed Marriage Celebrants to perform ceremonies overseas but, if and when this is approved, it will apply only to marriages performed by the Australian Marriage Celebrant on Australian soil, ie: in the Australian Consul General office in Bali or the Australian Embassy in Jakarta. A marriage performed by a foreign licensed Celebrant would not be a legal marriage if performed in Bali or anywhere except in the country in which the Celebrant is licensed to operate. DO NOT BRING A FOREIGN CELEBRANT TO BALI TO PERFORM YOUR MARRIAGE AND EXPECT TO BE LEGALLY MARRIED ! Australian couples may reconfirm this information with the Australian Registrar Generals' Office in Canberra. We have used Australia as the example here, not to give Australians any particular special attention, but simply because the statistics to date show that the majority of weddings taking place in Bali currently originate from Australia. @johan setiawan. Tema Tanda Air. Diberdayakan oleh Blogger.